You are currently browsing the tag archive for the ‘APQ’ tag. For the Winter Issue of Actually People Quarterly (APQ), I interviewed college professor Nigel Boyle who played the beautiful game in circumstances that most would consider unlikely. 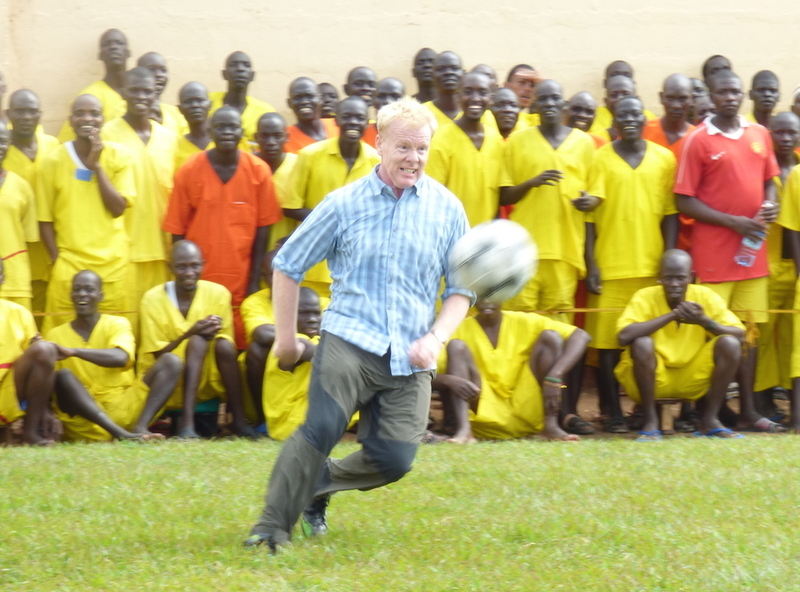 Nigel explains, however, that football is a way of life among the Ugandan prison population who welcomed he and other educators with untold warmth. The theme for the Winter APQ Issue was ‘Triumph.’ Nigel had a good game. It’s great to publish the APQ article, in full, here on the blog. Thanks to my friends over at San Francisco’s Carville Annex for ongoing collaborations. Nigel Boyle is a bit like me. He’s English, he’s quite white, he can’t control his bigger smiles, and he’s a mad football fan. Earlier this year, before I visited Nigel’s hometown of Claremont, California, I contacted him because he had been teaching in his local prison. I wanted to know more about that. I did not know he had taught in a prison in Uganda this summer, too. Nigel invited me to a soiree at his house. It was a reunion of the faculty, students and administrators involved in the Uganda prison teaching program as well as directors of partner organizations. I was made to feel very welcome. Nigel supports Aston Villa, who play in claret and blue. They’re based in Birmingham, have existed since 1874, and were one of the 12 founding teams of the English Football League. I support Liverpool who play in red and, down the years, have won more trophies than Villa. Neither team haven’t won many titles in recent decades. Nigel is one of those lucky people that has managed to merge his passion for a particular sport with his professional pursuits. He has taught seminars on the history and political economy of football and once delivered a conference paper titled “What World Cup and Champions League Soccer Teaches Us about Contemporary Europe.” Before he moved to California to teach at Pitzer College, Nigel taught at Duke and Oxford universities. During his party, Nigel entered the kitchen clasping a photograph. In it, he was pictured with teeth and fists clenched, in mid-sprint in front of a crowd of onlookers. It looked like he had just kicked a ball. He explained that the onlookers were prisoners in the Luzira Upper Prison, in Uganda. Naturally, I had questions. Prison Photography (PP): Why were you in a Ugandan prison? Nigel Boyle (NB): I was there as a volunteer with the Prison Education Project (PEP), a California program founded by my colleague Professor Renford Reese. PEP had been invited by a Ugandan academic, Arthur Sserwanga, who has been doing third-level education in Ugandan prisons. PP: So football in prison? NB: There are 10 “clubs” at the prison and they are all named after renowned European teams — Man United, Liverpool, Aston Villa, Leeds, Chelsea, Arsenal, Newcastle, Everton, Barcelona and Juventus. NB: Really. A league structure is an organizing principle inside. They all have long histories and fan clubs. They adhere to league codes of ethics and conduct. They have transfer windows! PP: Why were you playing? NB: I watched several games at the prison – tournaments between a game between the Luzira Upper Prison Team and another prison team (Murcheson Bay Prison) and one between the Luzira Upper Prison Team and the prison staff team. I got antsy as a spectator and put together a team of U.S. students and students from Makerere University. Games are the primary entertainment at the prison, 3,000 spectators. I was not sure when the game was going to happen which is why I was wearing my “teaching kit” not my Villa kit. We were playing the Arsenal club team. PP: How did the game go? NB: Arsenal started off by scoring early and then went easy on us as we had some inexperienced players on the team. But then we started to play a bit, got an equalizer and the crowd really got into it. They were supporting us mostly (apart from the Arsenal fans, of course). The crowd was most delighted with the “the girl” on our team, a U.S. student called Ashley. That she could actually play well led to roars of approval. As the old Muzungu* on the field I also drew some cheers when I showed I knew how to kick a ball. NB: It was the friendliest “friendly” game I have ever played in. In fact all games at Luzira are played in a very gentlemanly fashion – the prison soccer association constitution demands it and sets explicit standards for player and fan behavior, above anything FIFA* can manage. PP: What are your strengths and weaknesses as a player? NB: I’m your basic Brummie* parks player. Good in the air, poor control, good passer, slow. I played at the back most of the game, with 10 minutes to go it was 3-3 and I moved up front. PP: That’s when your moment of glory came? NB: I scored with a sidefooted shot from 15 yards out, with only 8 minutes of the game to go. The crowd which was about 3,000 roared. PP: A crowd of 3,000!?!? NB: My childhood fantasy came true. Then I scored again. I was through on keeper, chasing down a clearance. We won the game. Being “interviewed” about my performance in this game only adds to the sense of my childhood dream coming true at the age of 53! After the game there were speeches (there always are after Luzira UP games). I thanked the Upper Prison Football Association, and it’s president-prisoner Opio Moses, whom I’m proud to call a friend. PP: Will you ever play in front of a crowd that big again? NB: Only if I get back to Luzira again, and I would love to do that. PP: Are you at all tempted to retire on a high? NB: I know guys in their 60s still playing pick-up soccer and I intend continuing as long as my knees hold out. But this is the story I will be telling my grandchildren. PP: What’s football got to do with education? NB: I’ve taught a course on comparative political economy through football (or soccer/futbol/fussball) eight times, at three institutions: Pitzer College, the University of Landau in Germany, and at California Rehabilitation Center, which is a prison in Norco. Is there a better lens for understanding contemporary globalization out there? Certainly not one that engages students the way the beautiful game does. PP: How do Uganda prisons differ from those in the U.S.? NB: U.S. prisons use vast human and financial resources to dehumanize prisoners and deny them the ability to function as social beings. I’m only familiar with Level 2, medium-security prisons in the U.S., but these are militarized holding pens. Luzira Upper Prison is the top maximum security prison in Uganda, but staff carry no weapons, look prisoners in the eye, and treat prisoners as potential co-managers of the prison, not as human refuse. Resource starved Ugandan prisons allow prisoners to organize themselves into a civil society behind walls, and it’s through the football clubs and the Prison Football Association that prisoners have organized and bargained with prison staff. Upper Prison Luzira was a colonial prison designed to incarcerate and punish men who threatened British law and order. In the last 20 years, this colonial shell has been allowed to sprout prisoner-led education (literacy through degree levels), and sports and cultural organization that provide a training in how to be a productive citizen. U.S. prisons talk about “rehabilitation” but appear to be designed to induce PTSD. Brummie = a person born in Birmingham, England. Muzungu = Swahili word for white man. FIFA = The International Federation of Football Associations, known most recently for its bloated coffers, back room deals, golden handshakes and rampant corruption.